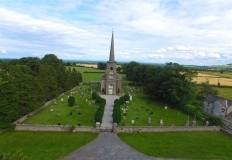 There have been centuries of monastic settlements in Laois – including the monastery founded at Durrow, by St. Columba, (famous for Book of Durrow) and the monastic settlement at Coolbanagher. Rev. A.J. 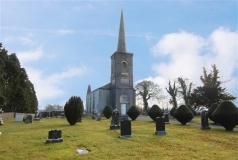 Fleury was rector of Coolbanagher, in 1779, when St. Peter’s Church was burned. Recorded Irish Times – ‘On February 2nd, 1779, the church at Coolbanagher, according to local tradition, was locked on the outside during Sunday Service, and the straw-thatched roof was set on fire’.2 The ruins can still be seen today. In June 1782 a decision was made to build at “the site of the Old Church of Coolbanagher”. This presumably would refer to a Church before St.Peter’s. On 12th June 1782 a meeting finally agreed to build on the present site, on ground given by Lord Carlow “at near the cross roads on the north side of Coolbanagher Hill.” It is also recorded …Site of St. John’s Coolbanagher given by Lord Kilburne*, near crossroads on north side of Coolbanagher Hill, 1872. (*Lord Kilburne or Earl of Shelbourne). There are documents in RCB Library recording Hon. Rev. William Dawson (a son of Lord Portarlington) applying in 1785 to build ‘The Glebe’, with details of how it should be built.3 Coolbanagher Glebe was built 1790. In 1808 the construction of a School House was begun next to the Church. This was completed in 1810 at a cost of £43-18s-9d. The Sexton, paid £6 per year, was to be paid an additional £5-7s-6d. for teaching ten poor children. in 1810 , the School House was finished. It was also ‘resolved that the church yard be enlarged, the part taken in to be walled and iron gates to be procured for church yard’. In 1811 (?1813) a spire was built on the tower of the Church. The vestry resolved that “£114-14s-11d, and no more, be appropriated for this purpose”. 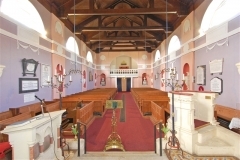 In 1820 the walls of the church were dashed and the woodwork was painted. In 1822 the roof was repaired and again in 1827 one third of the ceiling was repaired and new flags were laid in half the aisle. In April 1865 it was decided to substantially enlarge the Chancel with pulpit, reading desk and chancel rails3 . Plans were drawn up by Thomas Drew, F.R.I.A.I. – original drawings in RCB Library, Dublin. 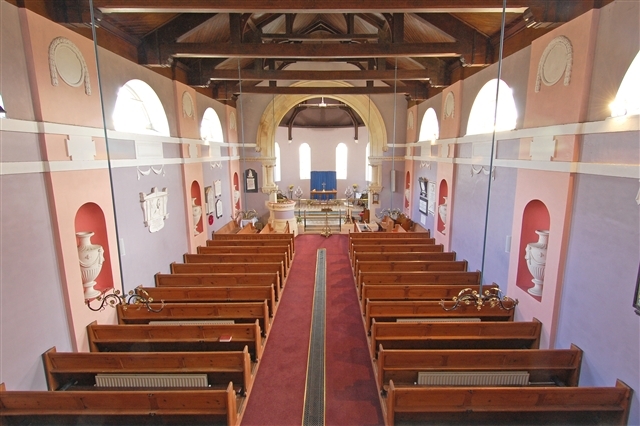 According to parish records this was done ‘to afford increased accommodation in the Church, so as to leave the aisle clear – which is at present inconveniently crowded’. The work was completed at a cost of £357. At the same time the original barrel ceiling was removed and the present ceiling put in its place. 3 Work commenced in 1868. 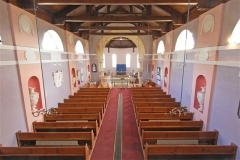 In the 1970’s the interior of Church was repainted in the Georgian colours and the pews were re-stained. in the 1980’s, Mr Cholmeley Harrison commissioned urns (which were in the original design by Gandon, but never executed) to be placed in the niches. 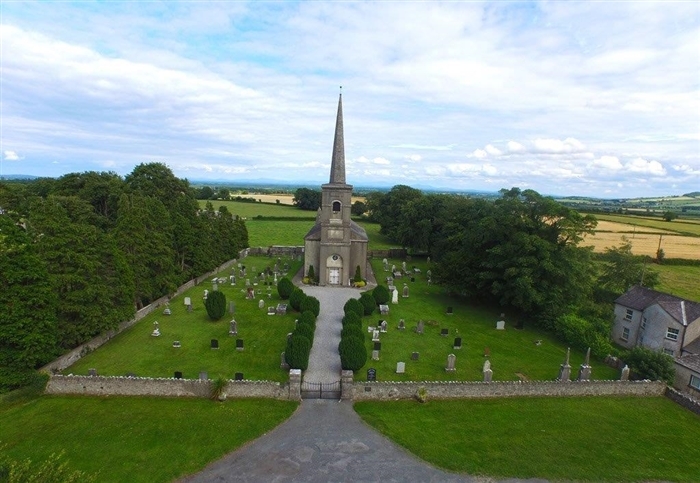 In 1985 the bi-centenary of Coolbanagher Church was celebrated with a Flower Festival and visited by over 2000 (designed by Mrs Doreen Adams – entitled ‘For the beauty of the earth’) and a Service of Thanksgiving. In 2010, the parish celebrated the 225th Anniversary of Coolbanagher Church and the 200th anniversary of Coolbanagher School – with an Exhibition on the ‘History of Coolbanagher Church & School-house’ and a Service of Thanksgiving. The guest preacher in 1985 and 2010 was Dr. Robin Eames. The Church stands today as attribute to a great architect and the care and attention of faithful clergy and people who have worshipped here for over 225 years. 1 The A to Z of Laois in 1837 by Samuel Lewis. 2 The Irish Times. 3 RCB Library. Braemar Road, Dublin.. 4 Canon Cecil Wilson – various leaflets and The late Mrs Nancy Deverell – who recorded notes on Coolbanagher Church.